We had a very pleasant and comfortable stay at Eco lodge thank you very much! Loved this place! 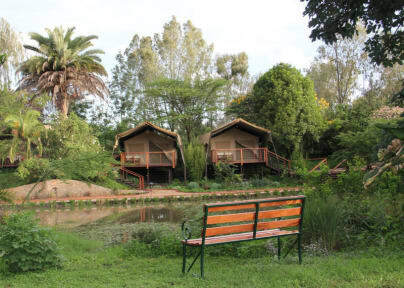 Nice relaxing retreat just outside of Nairobi. Staff were very friendly and the place was clean and comfortable. Would highly recommend. I really liked this place, but be aware that it’s really popular amongst the 65+ crowd, and some of our neighbors were quite grumpy when we decided to stay up past 9:00 pm. 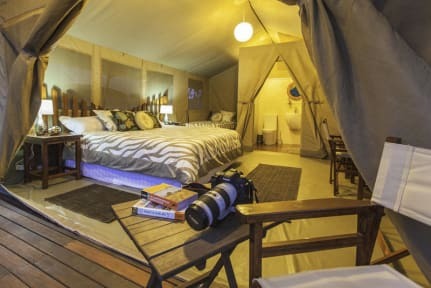 Wildebeest Eco Camp is a hidden gem in Nairobi. Stayed in the four bed family room and couldn't recommend it enough. Perfect for a few days of relaxation. Food was delicious and breakfast is included which is an added bonus. WiFi is free, whilst not reaching our tent, signal was strong in the restaurant and around the pool. Tents are not secured, which is to be expected, but there is a safe that was adequate for four females in the twenties with camera equipment. Highly recommend! Awesome stay! Beautiful atmosphere and I imagine it’s especially great if you have a car. If you taxi here, you’ll need to taxi everywhere and that will cost you more than your room. Definitely recommended if you want a place to relax. Internet only works in the restaurant. Ok, so this is the first real rant I've ever posted. I'll break it down into 2 sections... The hostel is awesome, great facilities, pool, restaurant, etc! This part of Nairobi is awesome with lots of great experiences. Ok, so why a split review? Basically upon check-out we were BLATANLTY stolen from, or at least attempted... The staff blatantly under counted our KES (by $2k), and we witnessed them pocket another $500KES. We stood our ground and recounted, but it was a terrible experience. The low rating is due to the staff and their strategy of robbing people of their hard earned money: 1. When I was leaving the receptionist (Kenyan woman) offered me a taxi to airport for 3000KSh. I assumed this was a fair price until I looked on Uber and got it for 700KSh. 2. I was very fortunate to avoid the fatal ethiopean airline crash and wanted to rearrange my flight afterwards but they wouldn’t let me use their landline.